If you browse through Miss Gina Designs, you will find a variety of unique handmade items in a wide range of styles. They carry products to suit all tastes including conservative, preppy, funky, folk-artsy, etc. This is truly a store where there is something for everyone. What does Miss Gina Designs sell? Well, she carries many things including aprons, blankies, clutches, wristlets, purses and even jewelry! Many of the items at Miss Gina Designsare OOAK (One of a Kind) and can be customized with embroidery or handpainting to suit your needs. I love the idea of OOAK and that makes your purchase even more special! Quality and customer service is extremely important to the folks at Miss Gina Designs and they truly appreciate everyone of their customers. Miss Gina Designs loves creating products that customers can be proud to use or give to friends and family as gifts. 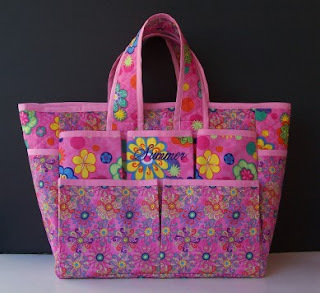 I love this Custom Diaper Bag and think it would make a great gift for a new mom. As many of you know, I love jewelry. 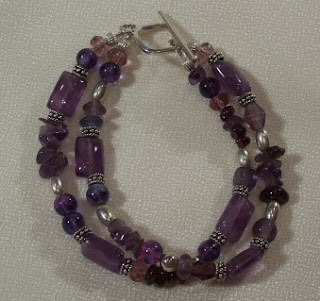 I think this OOAK Purple Bead Bracelet is really cute. Miss Gina Designs sent me this handmade wristlet for my review. My first impression was that I loved the beautiful fabric! 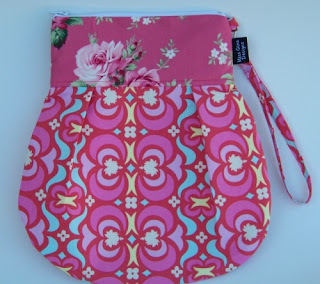 They used a combination of two pretty fabrics and they are in my favourite colour- pink! It has a very stylish, feminine look that would suit many of my outfits. Another thing that impressed me was how well made it is. This is a handmade item, yes- but its extremely well put together and sewn and very professional looking. I can tell whoever put this wristlet together knew what they were doing. I always check that when I buy handmade things to see if they will fall apart and was happy to discover that this bag was of high quality craftsmanship. Thumbs up from me! I wanted to put the wristlet to the test to see how it felt when I went out shopping. I put my wallet, sunglasses, car keys and cheque book in the wristlet to see how it would hold up. It is fully lined and not at all flimsy feeling. 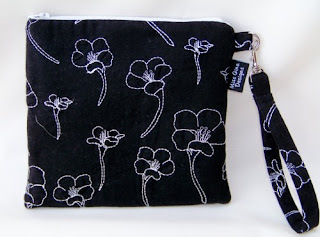 It also has a zipper closure to keep all your goodies safe inside. The wrist strap is removable, but I decided to keep it on and just looped it around my wrist. I felt comfortable wearing it and found it very functional to use. It did the job as it was intended to do and I plan to definitely wear it again on other outings. Plus the price can’t be beat. This particular one that I received is $12.00!! To me that is extremely reasonable and definitely well worth the money. 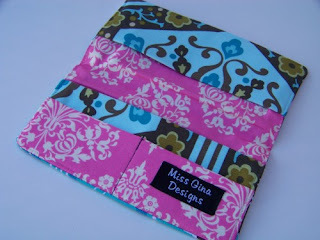 If you have a look around at other products at Miss Gina Designs, you will find they are very affordable. Overall I loved what my wristlet because it is the perfect combination of style and functionality and the price can’t be beat! To purchase any of Miss Gina Designs products, please visit their website.